As of a few days ago, Las Vegas has decided to grant a temporary license to Lyft, giving their drivers the first shot at the city. Surprising, since Uber did offer much more, and has yet to be granted a license. Lyft’s license is reportedly good for six months, said a spokesperson for Lyft. Regardless of the fierce opposition within the tax industry and with insurance regulators, new technology companies such as Uber and Lyft, may finally get the upper hand, obtaining the ability to put drivers on the roads of Las Vegas – but only if they behave themselves. Two weeks have passed since it was reported that both ride-sharing start-up giants Lyft and Uber would apply to the City of Las Vegas for their own business licenses, giving them the opportunity to put their fleet of drivers on the road in one of the busiest cities in the world. Although there has been opposition to the operation of these ride-sharing companies from larger entities, cities like Las Vegas have been supportive in the integration of these much needed businesses. 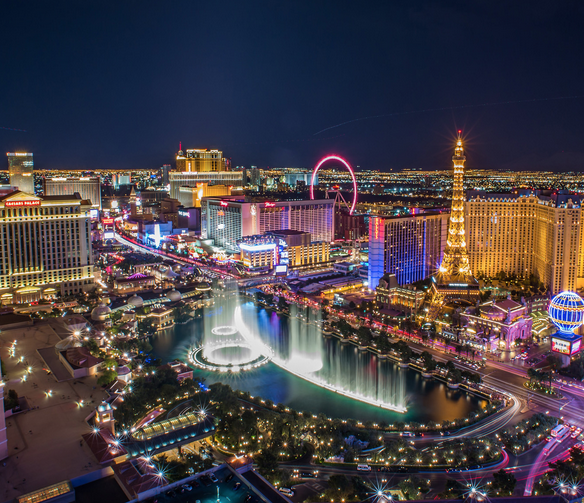 Both companies have spent the last few months sending their employees to Las Vegas repeatedly, attempting to create their own respective launches within the city. Uber has been openly accepting applications from their drivers and inspecting vehicles for over two weeks now, while Lyft has also been recruiting and conducting background checks for their drivers. While both companies are eager to break into the Las Vegas scene, both companies are putting forth two different approaches to the mix. For example, Lyft has offered to pay the State of Nevada $150,000, in order to put 2,500 drivers on the street in the first two years. Uber however, has offered the state a much larger amount, $500,000 for a fleet of an unlimited size. Uber officials have reported that as of a week ago, they already have over 1,000 drivers contracted and screened with their vehicles inspected, and over a hundred more on the way. Lyft spokespeople have reported that their company has 1,000 drivers in Southern Nevada alone. Although Clark county has requested that the companies wait until they have business licenses to begin operating within the city limits, both companies have elected to forgo the suggestions and began operation in the afternoon on September 15th. With almost identical rates, the only thing holding back these two companies from darting all over the map, was state approval. Now that has been granted, Clark county is working as quickly as they can to create a business license just for these new companies. It shouldn’t take long to see results however, since the area is in terrible need of affordable, easy to access transportation. Other cities close to Las Vegas such as Henderson and Summerlin are also in need of the drivers, since accessible public transportation is sparse. Although, the state has approved operations for both Uber and Lyft, counties have decided to require business licenses of the new companies. Clark county, where Las Vegas is located, is one of them. Although the licenses were scheduled to take until October 20th to be created, both companies decided to tempt fate and start offering their services anyways. Some are concerned that the number of traffic violations and DUI’s could go up as a result of the new fleets being released onto the city, and they may not be far off from the truth. Since last week, county officials have been giving citations to more Uber and Lyft drivers near the Las Vegas airport. Since last Monday, at least 237 citations had been issued. This is a large reason why the counties and surrounding areas are interested in making ride-hailing companies like Uber and Lyft obtain licenses to begin with. State Senate Majority Leader Michael Roberson welcomed the launch of the companies, asking the county to work together to find a workable license solution, since temporary licenses for the ride-sharing programs had already been denied. “Getting them on the road is good for them, and it’s good for Nevada. Every trip transportation network companies take will create critical revenue for the highway fund and for the new medical school at UNLV.” Roberson said enthusiastically. The dispute for licenses is not difficult to navigate, but it has been ruled that the local government would not be allowed to impose any special business licenses on any of the transportation network companies, however, they were still able to collect fees for general business licenses. The trouble comes in the fact that there are not yet any general business licenses for these types of companies, and so Uber and Lyft, were asked to wait. Commissioner Larry Brown spoke to representatives from both companies and said to them that he would need them to wait until after October 20th to begin operating, asking for personal assurance from both companies. It appears that neither company wanted to make those kinds of guarantees. With state officials shaking their heads at the apparent ‘double-talk’ from the companies, it doesn’t appear that it will be enough to shake Uber and Lyft from their path. It does however, appear that the local government in Nevada, would appreciate it if the companies would simply be as co-operative and patient as they say they are.